Wednesday, April 17, 2019 - Kenyans took to social media and called for the arrest of Garissa Senator, Yusuf Haji, who is the father of the no-nonsense Director of Public Prosecutions (DPP), Noordin Haji. This is after a video emerged showing Haji shooting in the air using his pistol infront of a public gathering. He shot in the air several times as uniformed police watched. 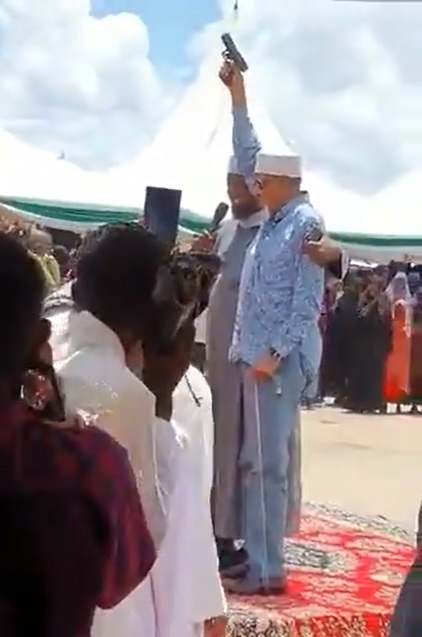 Even as Kenyans makes noise on social media and call for his arrest, it has emerged that Haji shot in the air during a wedding ceremony and the shooting is part of Islamic wedding ceremonies. He shot in the air when called to address guests during the wedding as a symbol of might and power.